Halloween Day is around the corner and all are making ready for the Halloween costumes, food and settings for the Halloween day party. Spooky scary foods are special for halloween day and pumpkins are very special. So i planned to prepare a pumpkin cake for this Halloween day. Pumpkin cake finally i made it in pumpkin shape. Easy to prepare cake and the icing too super easy just mix and whip. About the taste of the cake it is soft and moist, mildly spiced with nuts and raisins. So flavourful cake similar to a fruit cake. Nutty and Fruity Halloween Delight!!! Peel the pumpkin and cut them in to pieces. Add water and cook till soft for about 10 minutes. When it becomes soft to touch drain the water and allow to cool. Transfer the pumpkin pieces into a blender and finely puree them; set aside. In a separate bowl sift/ sieve the flour, baking powder, baking soda together. Add in the spices cinnamon powder, clove, nutmeg and ginger powders; mix well. Take a tablespoon of flour from this and coat the raisins and walnuts (to prevent sinking inside the batter);set aside. Preheat the oven to 160 degrees for 15 minutes. In a bowl beat the eggs till frothy using electric beater or hand whisk. Powder the sugar and add into the egg mixture. Add the cooked pumpkin puree and oil and vanilla essence; blend well. Add this spiced flour mixture half a cup at a time and mix well repeat the process till the whole flour mixture get incorporated with egg mixture. Fold in the raisins and nuts inside the cake batter. Grease the pan (Use one bundt pan or two 20 cm round cake tins)with oil or butter and dust with a tablespoon of flour by tapping the pan and coat the pan without touching with hands. Pour the batter evenly on the cake pan and level the top and tap slightly to remove any air bubbles. Bake the cake for about 1 hour or till the inserted skewer comes out clean from the cake. Allow the cake to cool down completely before icing. In a bowl add cream cheese, thick cream and powdered sugar. Beat till well combined. Take a tablespoon of icing and add green food colour. Add orange food colour in the remaining icing; mix well. Apply the green icing on the ice cream waffer cone for the pumpkin stem. Fill the cake's cavity with anything edible or fill with tissue or foil paper and keep the stem on top. Apply orange colour icing on the cake. Apt recipe for this season. Love the icing and looks very yummy. 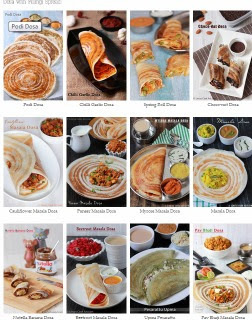 Love all your creative recipes. Beautiful clicks too! 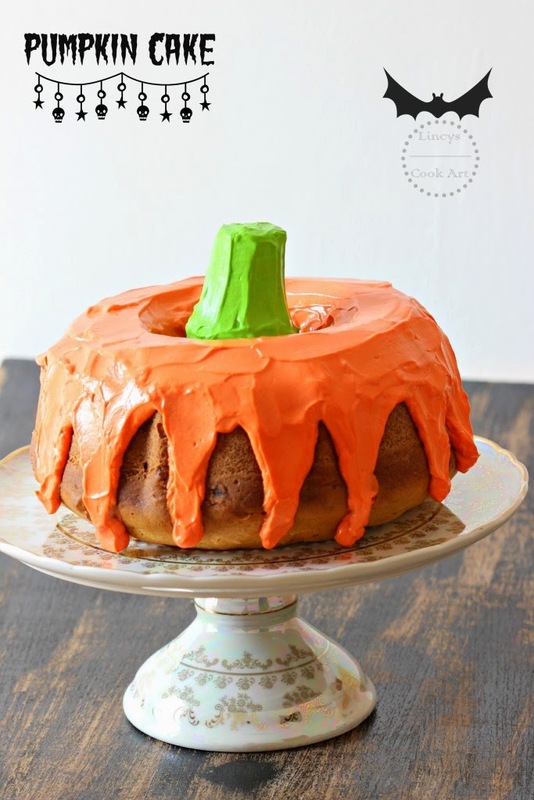 Lovely pumpkin cake for halloween..
Wow !! colorful cake .So inviting .. Replace eggs with half a cup of yogurt.